Kid’s Place 4 Fun was a mere dream for Samara when she began her journey as a young business owner at the age of 23. Her love for creativity and child psychology sparked the idea of opening an art studio so she could help kids learn how to express themselves with creativity. In September of 2000, she took a leap of faith and opened Kid’s Place 4 Fun. With a little trial and error, she quickly learned what worked for her, and what she needed to do to get her business to take off. 16 years later she is happily married, a proud mom of two, and is successfully living her dream of running a business that has brought joy to countless kids. After establishing her business, Samara started to noticed the trend of more people using the internet for things like online booking. When she found PlaceFull, she knew she had found the right place to help her optimize her online presence. PlaceFull designed a new website for Samara and she has seen her bookings sky rocket! Since the new site went live, she has had 7x as many online bookings. Her strategically placed “Book Now” buttons and easy ways for customers to navigate to her event pages has made it simple for customers to place their reservations online. As her bookings roll in, Samara has found that PlaceFull’s Online Booking is not only easy, but it has freed up a huge chunk of her time. She now spends less time on the phone and less time having to manage her booking calendar. With more time on her hands, Samara has gone from focusing on walk-in painting and parties for the past 16 years, to now being able to offer classes and workshops as well! PlaceFull has made booking online convenient for Samara’s customers as well as for her. She now has the luxury of being able to manage her business from anywhere and is able to do a lot of work from home without having to stress about being away from her business. Most importantly, this means getting to spend more time with her family. The customer support Samara has received throughout her experience with PlaceFull has been one of the key factors in her successful transition to online booking. At PlaceFull, we really strive to be there for our customers. Online booking is meant to bring ease to the hectic life of a business owner, and we are always there to help do just that every step of the way. Kid’s Place 4 Fun is a drop-in art studio and premiere party place located in Needham, MA. If you’re in the area, be sure to visit and take your pick of painting pottery, plaster, or canvas, mining for gems, or making a candle – Samara and her staff would love to have you! 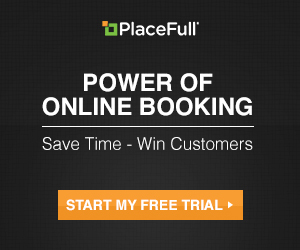 To learn more about PlaceFull give us a call at (206)624-0295 or click here to schedule a chat with us. Categories: Booking Trends, Merchant News, Merchant of the Month, PlaceFull News, Software, Uncategorized | Tags: booking software, merchant of the month, online booking, online reservations, online scheduling, paint your own pottery, pottery studios | Permalink.